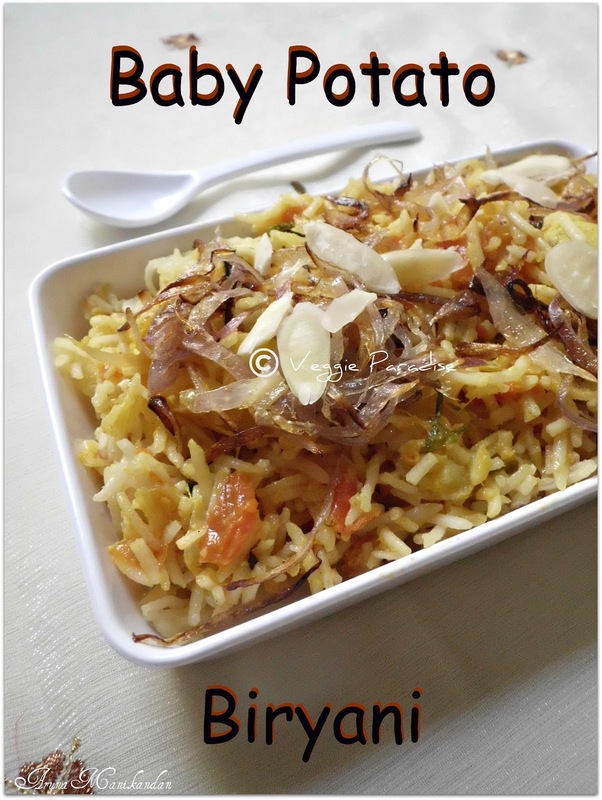 Baby Potato Biryani - Rice cooked with baby potatoes and spices. A good biryani must have a wonderful aroma,but not too spicy and more specifically the rice must be cooked perfect,must be loose and chewy. This dish needs more time and patience , but no doubt that it makes a great Sunday Feast :). Put the spices into a pan with 2 cups of water . 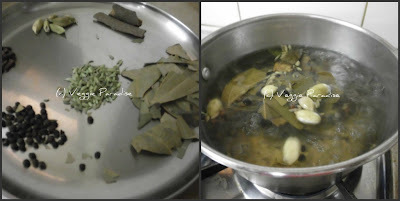 Bring the water to boil, turn off the heat, cover the pan and allow to infuse into a savory aromatic liquid. 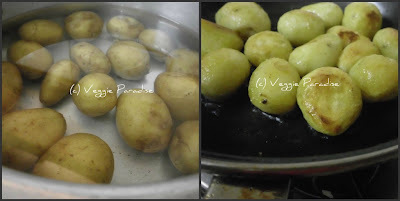 Pressure cook the baby potatoes for 2 whistles, peel the skin. Heat oil in a non stick pan and shallow fry these baby potatoes, till it turns slightly brown. Place them in a kitchen towel, to drain off the excess oil. In the same pan, add 2 tsp. 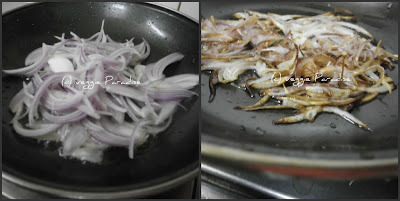 of ghee and fry some sliced onions until golden brown and reserve for garnish. 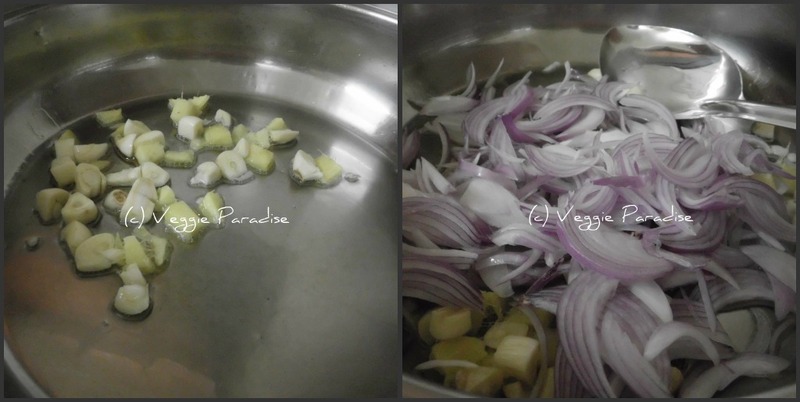 Heat oil in a pan, add the chopped garlic and ginger, fry for a min. 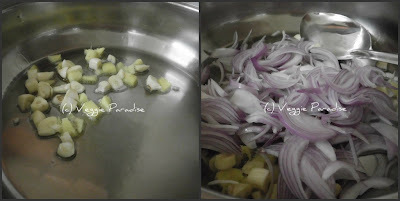 Add the remaining chopped onions and fry until soft. Allow it to cool and whizz the mixture in a blender. 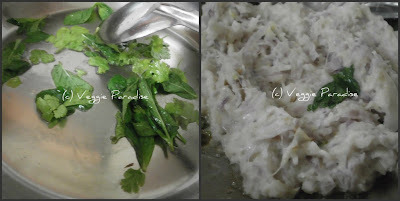 Heat another tablespoon of oil in a heavy bottomed pan, add in the coriander and mint leaves, fry for a min, add the grinded mixture and fry for a couple of mins. 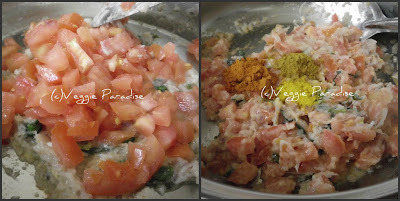 Now add the chopped tomatoes along with the spice powders , mix well and cook in low flame until the oil begins to seperate. When the tomatoes get blended well, tip in the baby potatoes and mix it gently. Cook for few more mins. Remove from heat and reserve. 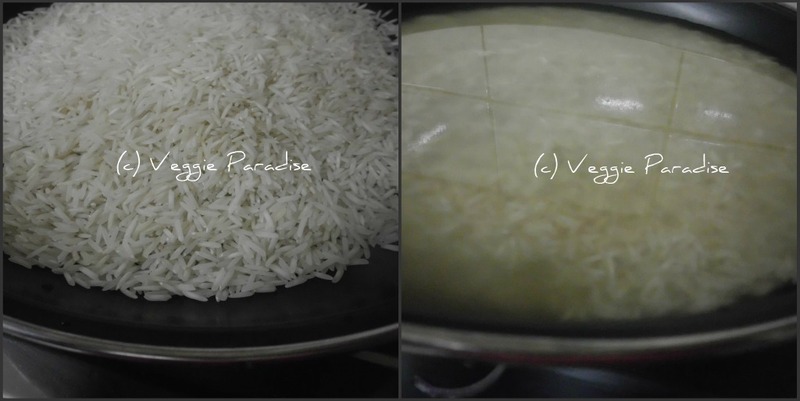 Now its time to cook our rice, In a pan, add the rice along with savory liquid, strain and add it. Reduce the heat ,cover and cook until the liquid gets evaporated. Finally rice is ready. Mix the prepared baby potato masala with rice and enjoy. Before serving garnish with fried onions and flaked almonds. I have added tomatoes, you can also replace with tomato puree. You can adjust the spice powders according to your taste. Wow..luvly template aruna...Biryani luks out class.. Awesome preparation, I like the way you have added the aromatic water to the rice, nice idea.. Tempting and mouthwatering rice. 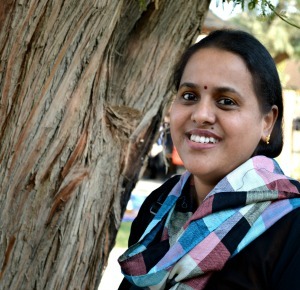 Nice clicks. totally agree with u that for biryani rice should be cooked very carefully. ohh the biryani looks perfect.. perfect biryani like this is highlight of the day! 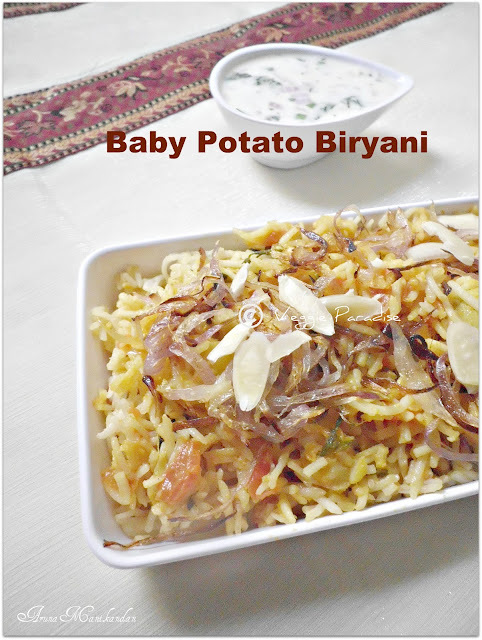 I have never thought of baby potatoes with biriyani. 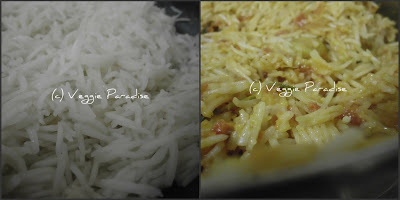 Cant take my eyes off the pictures..
Aha, this reminds me of a biriyani made by my mother to pack for lunch. Great photos, sure to be good. I remember it was a favourite with me and my sisters. I will ask my mom and post my version soon. 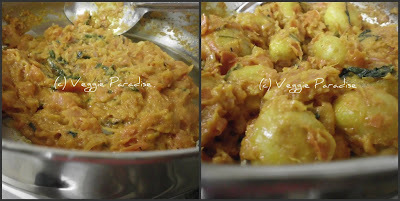 Delicious, I love the pic of baby potatoes coated with masala. 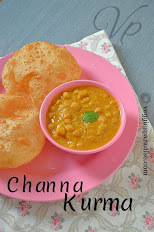 A very aromatic and lip-smacking meal! yummy biryani. worth trying it out. so flavourful biryani..perfectly done and super tempting..
Baby potato biriyan looks awsome and yummy..
Love this flavourful and tempting biryani. Delicious looking Briryani ,beautiful click.